Parvin Fahimi, the mother of Sohrab Aarabi, was reportedly told by the Iranian authorities not to make a scene at her 19 year old son’s funeral a few weeks ago. Plainclothes officers then attended to hear her ignore the warning and rage against the death of her son in a gut wrenching speech that ended with “No one can stop me! No One!” Since then no one has, and she seems to be daring them to try. Within days of the funeral she was visited by Mousavi and his wife, Zahra Rahnavard (another powerful woman in her own right) and footage of their meeting was made widely available across the internet. She also spoke with BBC Persian that week, a satellite network who’s broadcast the Iranian authorities routinely try to scramble. 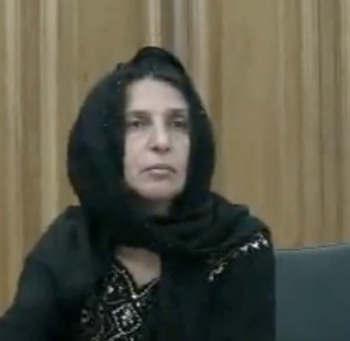 Yesterday Parvin resurfaced to meet with the Tehran City Council and spoke at length about her ordeal, asking why her son was killed and who killed him (Videos: Part One & Part Two – transcript below). Her outspoken criticism of the circumstances of her son’s death may be setting her up for a dangerous confrontation with the regime, but with the attention she has drawn it might be very difficult for them to try silencing her without risking an even greater public relations disaster. It is reasonable to assume that if she were to be arrested she would instantly become one of the most famous prisoners in the country, and critical international attention would quickly focus on her captors, probably even resulting in a solid media hit. Americans will remember a few years ago when another mom, Cindy Sheehan, spent her every waking moment stalking President Bush (W) over the death of her son in the Iraq War. She became the effective face of the anti-war movement for much of the country. While it remains to be seen how the grief-powered courage of Parvin Fahimi will play out, she should be watched closely by the international media, and if they’re smart the opposition inside Iran will work to raise her profile as high as they can. One mom might not be able to bring down a government, but this one seems like she might be willing to try. Mothers of murdered children simply have nothing left to lose.